One personal story, the story of Nathan Peled, emphasizes the purpose of our ride: many weeks after he joined our R4S team for riding from London to Jerusalem, Nathan Peled opened-up about his reasons for joining the ride; his wife Ruth Peled (56) and his granddaughter, Sinai (15 months old) (may their memory be blessed), were murdered, in 2002, in a terrorist attack committed by a Palestinian suicide terrorist in a major mall near Tel Aviv. Joining Nathan, in his personal remembrance journey, we decided to dedicate R4S ride, mainly, to the memory of Ruth and Sinai. In this context, for saluting the People of Israel, in sign of recognition of the Israeli contribution to the Humanity,we are organizing Ride4Solidarity (R4S) ride to hit the road in June 2017. R4S is a motorcycle ride that will begin in the West of free, democratic,progressive Europe,and it will end in the only truly free, democratic, progressive country in Middle East, the State of Israel. June 10, 1967: The Six Day War is over with victory for Israel. The plans of its neighbours, supported by USSR, to annihilate the Jewish State have failed. June 13, 1967: The USSR, the state behind the Arab war on Israel, sends a letter to the UN asking that the UN take measures against the “aggression” of Israel. R4S is open to any motorcycle biker, older than 35, who has a heart that beats for freedom, for respect among people, for life, for democracy, for peace and for the State of Israel. We already have 12 registered bikers coming from the USA, Romania, Hungary, Germany, Switzerland, Israel. We estimate the cost of the ride to be between 5000 and 6000 euro per rider, including fuel, road taxes, ferryboat fees, accommodation and food. "Good Luck on your way to Jerusalem the holy city." "Good Luck on the Ride!! Sorry I couldn't join you, but will be there in Spirit!! Ride safely and G-d Bless!! Am Yisrael Chai!!" Maximillian Marco Katz is the initiator, the spirit and the organizer of the R4S 2017. As project and business manager, Maximillian created, administered and managed, during the years, diverse commercial operations in Romania, Israel, the US and Africa. In 2002 he established and he is coordinating since, on voluntary basis, the Center for Monitoring and Combating Antisemitism in Romania (MCA Romania). In 2016 he became the Vice-President of the Zionist Movement in Romania(ASR). 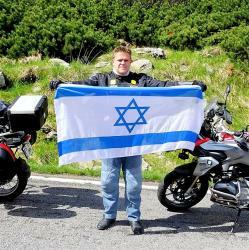 In 2015 Maximillian was one of the 11 Israeli bikers taking part in the Back to Berlin ride, recreating the 1930 motorcycle ride, when 11 Jewish bikers traveled from the British Palestine to Europe. Joining Maximillian as a co-organizer, there is Jozsef Horvath, a civil engineer born, educated and living in Budapest, Hungary. Between 1998-2010, Jozsef was the Chairman of Maccabi Hungary. Since 2011 he is the Head (Rosh Hakehila) of the Bet Shalom Synagogue in Budapest. Jozsef also participated together in the Back to Berlin 2015 ride. It is about doing more than just screaming against terrorism; it is about giving a damn. It is about taking action. It is not about the money! 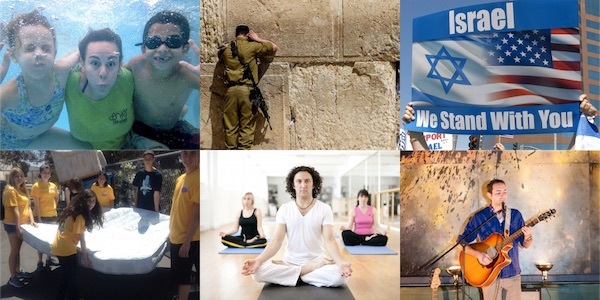 It is about showing support for the State of Israel and for all the terrorism's victims. it is about doing something, more than just talking, something that will make us participants in the fight for life and hope.